Energy audit is a key requirement for an integrated iron and steel plant which helps it to identify and realize energy efficiency improvements in a systematic way. It assists the steel plant management in understanding how it uses energy and helps to identify the areas where waste occurs and where opportunities for improvement exist. Energy audit is the inspection, examination, analysis and evaluation of the physical and financial processes of the steel plant relating to the use of the energy. The aim of the energy audit is to systematically identify the potential for saving energy and make recommendations for improvement. Energy audit is the key to a systematic approach for decision making in the area of energy management.It attempts to balance the total energy inputs with its use, and serves to identify all the energy streams in the steel plant. It quantifies energy usage according to its discrete functions. It is an effective tool in defining and pursuing comprehensive management of the energy usage in various processes of the steel plant. Energy audit helps to understand more about the ways energies and fuels are used in various processes of the steel plant. It helps in identifying the areas where waste of energy is occurring and where scope for improvement in energy consumption exists. It gives a positive orientation to the energy cost reduction and helps to keep focus on variations which occur in the availability and reliability of supply of energies and their costs, decide on appropriate energy mix, identify energy conservation technologies, retrofit for energy conservation equipment etc. It is the translation of conservation ideas into realities, by identifying technically feasible solutions with economic and other organizational considerations within a specified time frame. Energy audit consists of a pool of activities (systematic procedure) focused on analysis of current energy need and usage based on the technologies used and the valid technical standards. It is the analysis of problems (weaknesses and deficiencies). It effectively identifies and quantifies in detail the possibilities of energy savings tailored to the steel plant being analyzed. It consists of field work. Energy audit is an economy tool having a dynamic character. The primary objective of the energy audit is to determine ways to reduce specific energy consumption and in turn to lower the operating costs. Energy audit provides the plant management a reference point for managing energy in the steel plant. It also provides the basis for planning a more effective use of energy throughout the steel plant. Energy audit is a macro statistical analysis method. It is a complete monitoring process of the procurement, storage and the generation of various energies as well as their consumption in the steel plant. It makes a thorough analysis of energy consumption and energy saving at different shops of the plant. Statutory requirements as well as the requirements of various standards are to be considered while carrying out the energy audit. The energy consumption index from the energy audit is helpful for the plant management to evaluate and monitor the use of the energy in different shops of the plant. The steel plant management can improve the energy usage as well as the economic benefits achieved by the implementation of the energy saving measures identified during the energy audit. Hence the energy audit is an effective measure to realize the energy saving for the steel plant. At the same time, it creates a platform so that the steel plant can compare its performance with other steel plants for the performance improvement. The objectives of an energy audit can vary from one steel plant to other steel plant but the main objective of conducting an energy audit remains the same. This main objective is to understand how energy is used within the steel plant and to find opportunities for improvement and energy saving. Energy audits are sometimes also conducted to evaluate the effectiveness of an energy efficiency program. There are several relatively similar definitions of an energy audit. Some of them are given below. “Energy audit is defined as a systematic, documented verification process of objectively obtaining and evaluating energy audit evidence, in conformance with energy audit criteria and followed by communication of results to the management”. The energy audit of a steel plant is to include the audit of the following activities. Energy audits in a steel plant are normally grouped into the following types (Fig 1). Preliminary energy audit is a relatively quick exercise. In this type of energy audit, readily-available data are mostly used for a simple analysis of energy use and performance of the plant. This type of audit does not require a lot of measurement and data collection. These audits take a relatively short time and the results are more general in nature. The objectives of a preliminary audit are as follows. Detailed energy audits are diagnostic type of audit where more detailed data and information are required. Measurements and a data inventory are usually conducted and different energy consuming processes and systems are assessed in detail. Hence, the time required for this type of audit is longer than that of preliminary audits. The results of these audits are more comprehensive and useful since they give a more accurate picture of the energy performance of the plant and more specific recommendation for improvements. Detailed energy audits can be further broken down into the following. Key steps for conducting the energy audit of a steel plant are described below. Energy audit starts with the preparation for the audit which includes identification of the energy audit tasks. These tasks include type and scope of the audit and the time frame available for conducting the audit. For effectively performing the tasks within the available time frame, the auditing team is organized along with the identification of the regulatory requirements and the applicable standards. 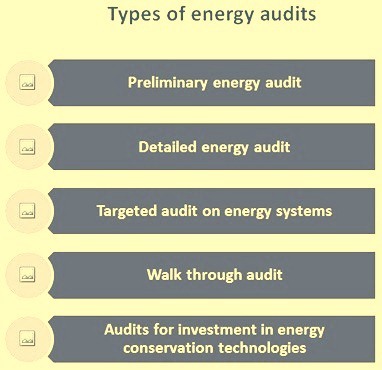 Energy audit is launched with the identification of the boundary and units for the energy audit and the tasks are allocated to the team members. The audit checklist helps the auditor to conduct the work in a systematic and consistent way. The checklist is to include (i) steps to be taken during the energy audit, (ii) data and information that is required to be collected, (iii) existing measurement instrument and the data being recorded, (iv) required measurements during the energy audit and the list of parameters to be measured, (v) major processes and/or equipment to be assessed in more detail, (vi) list of main components of the results section of the audit report to be used for guidance, and (vii) other major concerns and considerations with respect to energy in the plant. The first and important step in the energy audit is the collection of the data. The data include information about the steel plant, its main products, its production capacity, output, energy consumption, energy mix and key energy using systems etc. The information regarding energy management in the plant including energy management structure and staff, energy management positions and responsibility, energy management documentation need to be known to the audit team. The data for collection is also to include production processes, equipment type, size, and capacity, inventory of equipment and previous reports on energy efficiency testing, main instrument used for data measurement, energy consumption and energy balance, including monthly and annual energy use reports, energy balance tables, energy cost tables, energy conversions used and heating values of fuels. Other information which need to be collected are raw materials quality and usage, including consumption reports by month and year of the raw materials and auxiliary materials used, main energy consumption indicators, including specific energy consumption, capacity and production of waste heat recovery units, fuel and electricity consumption indicators for each of the production shops, application of energy-saving technologies and measures, including adopted energy technologies and equipment and their impact, and the results of adopting waste heat recovery and the working of the energy management centre. While carrying out the energy audit, a visit to all the areas is to be made by the audit team to have firsthand assessment of process stability, equipment health, storages of fuels and raw materials, line leakages, flaring, and solid waste handling etc. Audit is also carried out on the energy management system being practiced in the steel plant. During the audit, status of the instruments and control equipment used for the energy data transmission and collection is to be checked with respect to their working, calibration and accuracy. A visit to the energy centre is normally made during the audit to have the first hand information about the energy data being monitored and the facilities available at the energy centre. The methods adopted for energy audit are based on the principles of energy conservation and of mass conservation. The theory of system engineering is used for the comprehensive closed audit of the input and output in the plant process. Each factor or link that affects the levels of energy consumption and material consumption of the steel plant is analyzed quantitatively, thereby finding out the problems of energy wastage and the energy conservation potentials. The causes are analyzed for putting forth the relevant recommendations regarding measures of rectification needed for the definite purpose of energy conservation. Based on the data collected, energy balance exercise is to be carried out for the each shop as well as for the whole plant. This energy balance is to bring out the type of energy being used at each stage of production. The collected data and the information obtained during the visits to different places by the audit team are analyzed using various statistical analysis tools. This analysis is also to bring out the energy efficiency of the processes, areas where energy usage is high when compared with the industry norms and areas where energy saving potential exists with the existing technology being used in the plant. The data analysis should also bring out the areas where substantial energy savings can be achieved through investments in the new energy saving technologies. During the energy analysis, indicators for energy use for each area of production as well as for the entire steel plant are to be worked out. This is also to be carried out for the calculation of energy costs. The analysis of energy audit should also bring out the key factors which impacts the energy intensity. The main objective of the energy audit of the steel plant is the making of the energy saving recommendations. Normally, auditing energy use is the most important component of the energy audit because it directly relates to how much energy-saving potential there is, and how cost-effective the energy-saving measures can be. The report of the energy audit is to include (i) description of related items of the energy audit, (ii) general situation of the plant giving the conditions of the main energy consuming systems and installations, and the status quo of the energy control system and energy consumption, (iii) the findings of the energy audit which include the calculations and analysis of the various energy consumption, and the evaluation on the energy cost and utilization effects, (iv) the test results of the main energy-consuming equipment including the operating efficiency and the energy consumption quotas of the main energy consuming systems and installations, (v) analysis on the existing problems and energy conservation potentials (vi) The economic and technical analysis and evaluation of the new technologies for energy conservation which are recommended for adoption in the plant, and (vii) conclusion of the energy audit and the relevant recommendations on rectification.